Affordable Tree Trimming, Removal and Care in San Diego. How Are Tree Service Costs Determined? A couple beautiful trees in your yard can greatly increase home value and add to the aesthetics of your property. However, trees can also become quite problematic sometimes if they are not carefully maintained. For example, each homeowner should trim tree branches and perform various minor maintenance tasks to ensure their beautiful trees and shrubs look at their best. If you’re not highly trained and skilled in the profession of tree trimming, tree removal or tree care, you should consider hiring an outside service to perform any tree related tasks, you’ll be thankful that you did in the long run, as trees can be very delicate, if trimmed incorrectly or injured during the tree trimming process they can become diseased or worse, they can die, then you’ll have an eyesore on your property that you’ll likely want to pay to have removed. If you’re looking for Tree Trimming Costs or any related service, look no further than Estates Tree Service. With over 25 years experience in the industry, we know what to do to make your trees look their best. We have serviced just about every type of tree imaginable, from Palm trees to oak, ficus, spruce, pine and eucalyptus to pruning fruit trees, shrubs and more we have hands-on experience, training and the tools required to ensure that the job is done right. When you call Estates Tree Service you’ll be calling a BBB A+ Rated Tree service company that provides the most affordable tree trimming costs! There is no such thing as two identical snowflakes, and the same can be said for Tree Service Jobs, there are no two jobs that are exactly the same, many factors can play into the cost of tree trimming, removal, and care, those factors are taken into account by our expert estimator Tommy Coone, who has been providing Tree Service to San Diego including Poway, Ramona, El Cajon, Santee, Del Mar and more for over 25 years. Estates Tree Service is equipped with the best tools for the job, including our 80-foot boom truck which can reach the top of even the tallest trees. The height of your tree does play a role in the tree service cost, in many cases, a taller tree will cost more to have trimmed, serviced or removed, however, the danger in trimming your tall trees by yourself is so high that it is simply not worth it. Estates Tree Service will explain the exact costs and the reasons for the costs during the on-site estimate. Tree Trimming costs can range from a hundred dollars to a few thousand depending on the size of your tree, however, even with pictures, we must still complete an on-site estimate to provide the actual tree trimming costs. 2. The Number Of Trees Can Affect Your Tree Removal Cost. Tree Service costs are also dependent on the number of trees that you need serviced, if you have one tree you can expect your bill to be on the lower end, however if you have hundreds of trees that all need tree trimming in San Diego, there will be a cost associated with each tree depending on many factors, however it is cost effective to complete all of your tree trimming, service, removal or care at the same time, since we provide a completely free estimate on-site, we can take a look at all of the trees on your property and provide advice on caring for your trees and our recommendations for each of your trees. 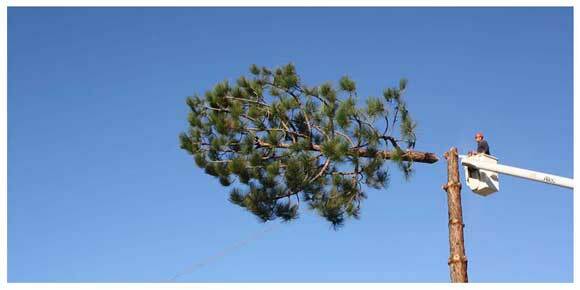 The tree service costs will be detailed and explained in the written estimate that we provide. Since we will be able to service many of your trees at the same time without requiring multiple trips, getting all of your Tree Removal, Service, or Trimming completed at the same time means that we can provide a more competitive rate than if you did them individually at separate times. 3. The Proximity of Your Trees and Structures Can Affect Costs. 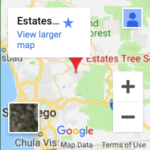 With the popularity of Solar Panels on the rise in San Diego, Estates Tree Service has found that we have many property owners looking for Tree Removal Cost estimates to remove trees from potential solar sites, this helps to keep solar panels clean, safe, and in the sun all of the time. However in many cases homeowner will call us to have their trees serviced once they start leaning or endangering their solar panels, home, sidewalks or driveways, in this case, we must factor in any existing structures or other dangers to our costs as we will take preventative measures to ensure that we leave your property looking better than before. For complex Tree Trimming jobs, or Tree Removal jobs there is sometimes a higher cost associated with our service, this is justified because we are licensed, BBB A+ rated and most importantly insured, so in the highly unlikely event that something were to happen your property would be covered, if you were to perform this work yourself, you’d run the risk of property damage or injury to yourself. Millions of people around the globe are injured each year attempting their own tree service, this is why it is crucial to call a trusted San Diego Tree Trimming company like Estates Tree Service. 4. Tree Diseases Can Play A Role Into The Cost of Tree Service. Bark Beetles, mold, and many other diseases are prevalent in San Diego, many of the Eucalyptus trees that we come across have been affected by disease in one way or another, as an invasive species to the area the eucalyptus tree is highly exposed to disease and prone to toppling over in wind once weakened by this disease. We take into account the health of your trees during our free tree service estimate, after 25 years in the industry and the industries best training our entire staff is qualified to evaluate the health of your trees and make suggestions on the handling of the trees, whether they need tree removal service, tree care, or tree trimming, we can provide you with advice that could end up saving you money in the long run.